The RDB-250 tube bender can bend at speeds up to 9 seconds for a 180 degree bend and can be programmed to bend up to 360 degrees, great for solid rod applications. Complex serpentine bends can be done with ease. This tube bender has a quick counter die release allows for quick removal of bends and allows for furthering bending pre-bent material. The counter die positioner on this tube bender has a numerical counter so repositioning of the counter die is a breeze when recalling bend programs. Engaging bends is as simple as pressing the forward foot pedal, and reverse pedal when complete. The RDB-250 tube bender has the strength to bend up to 2-1/2 inch tubing and 2 inch Schedule 40 Pipe, and can be programmed with up to 170 programs with up to 10 bends per program. Up to a 20 ft indexing table can be attached when multiple bends in variable planes are required that is great for big production runs. The RDB250 tube bender can bend at speeds up to 9 seconds for a 180 degree bend and can be programmed to bend up to 360 degrees, great for solid rod applications. Complex serpentine bends can be done with ease. A quick counter die release allows for quick removal of bends and allows for furthering bending pre-bent material. The counter die positioner has a numerical counter so repositioning of the counter die is a breeze when recalling bend programs. Engaging bends is as simple as pressing the forward foot pedal, and reverse pedal when complete. This tube bender is the most revolutionary and economical programmable tubing bender on the market with similar capacities. 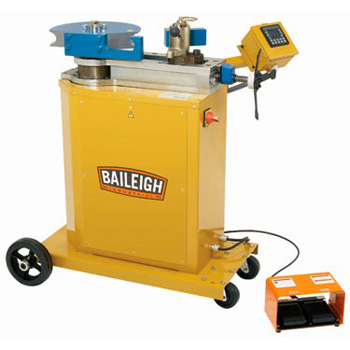 Baileigh Industrial is North America and Europe's trusted source for tube bending machinery.